192 pages | 10 B/W Illus. 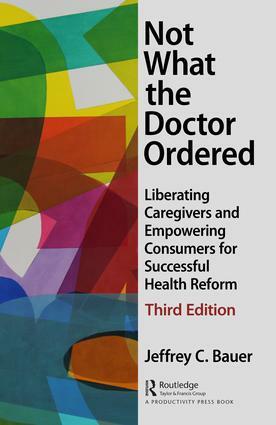 Not What the Doctor Ordered: How to End the Medical Monopoly in Pursuit of Managed Care contained some revolutionary solutions to the healthcare crisis when first published in 1993 by renowned healthcare futurist and economist Dr. Jeff Bauer. At the time he proposed that one true way to solve the problems of the healthcare crisis was by using America’s greatest economic strength – the free market – to produce a system that promotes both maximum choice and quality competition at significantly lower costs. Dr. Bauer quite simply suggested that the present physician medical monopoly ought to be dismantled to allow entry into the system by qualified, licensed non-physician providers such as nurse practitioners, physician assistant, pharmacist and physician therapists to name a few. While the AMA refused to acknowledge Dr. Bauer’s recommendations at the time, today we see the use of qualified, non-physician providers becoming more the norm than the exception. As managed care spread across the country and physicians were required to double the amount of patients they see in a day, the only solution was to utilized non-physician providers. Today, you are just as likely to get a flu shot from a nurse practitioner as you are from a primary care physician. This 25th Anniversary edition of Not What the Doctor Ordered, takes a look back at the predictions and recommendations made by Dr. Bauer when the first book published. He updates each of his points and gives us a status report of the impact of each recommendation. He goes even further to make his future predictions and recommendations on the state of healthcare today and going into the future. Acknowledgements. About the Author. Chapter 1 - INTRODUCTION AND BACKGROUND: 25 YEARS LATER. Chapter 2 - MEDICAL MONOPOLY: WHAT THE DOCTOR ORDERED. Chapter 3 - THE MEDICAL MARKETPLACE: LEARNING LESSONS OF HISTORY. Chapter 4 - CAPTAIN OF THE SHIP: LEGAL FOUNDATIONS OF INDEPENDENT PRACTICE. Chapter 5 - ADVANCED PRACTITIONERS: HEALTH PROFESSIONALS WHOSE TIME HAS COME. Chapter 6 - CASE STUDIES. Additional Readings. Dr. Bauer is an internationally recognized health futurist and medical economist. As an independent industry thought leader, he forecasts the evolution of health care and develops practical approaches to improving the medical sector of the American economy. He is widely known for his specific proposals to create an efficient and effective health care delivery system through multi-stakeholder partnerships and other initiatives focused in the private sector. Dr. Bauer has published more than 225 articles, books, Web pages, and videos on health care delivery. He speaks frequently to national and international audiences about key trends in health care, medical science, technology, information systems, reimbursement, public policy, health reform, and creative problem-solving. Dr. Bauer is quoted often in the national press and writes regularly for professional journals that cover the business of health care. His latest books are Paradox and Imperatives in Health Care: How Efficiency, Effectiveness, and E-Transformation Can Conquer Waste and Optimize Quality (Productivity Press, 2008) and Statistical Analysis for Health Care Decision-Makers (CRC Press, 2009). His two previous books are Telemedicine and the Reinvention of Health Care: The Seventh Revolution in Medicine (McGraw-Hill, 1999) and Not What the Doctor Ordered (McGraw-Hill, 1998). He is currently finishing a book on strategic forecasting methodologies, Upgrading the Crystal Ball for Business Insight: Five Reasons Why Forecasting Must Replace Predicting and How to Make the Change (Taylor & Francis, Spring 2013). As a consultant, he has assisted hundreds of provider, purchaser, and payer organizations with strategic planning and performance improvement. He served as Vice President for Health Care Forecasting and Strategy for ACS, a Xerox Company, from 1999 to 2010. His previous consulting firm, The Bauer Group, specialized in consumer-focused strategic planning and development of clinical affiliation agreements for multi-hospital networks from 1984 to 1992. In addition, Dr. Bauer has a strong foundation of academic experience. He was a full-time teacher and administrator at the University of Colorado Health Sciences Center in Denver from 1973 to 1984, where he held appointments as associate professor and as Assistant Chancellor for Planning and Program Development. He also served concurrently for four years as Health Policy Advisor to Colorado Governor Richard D. Lamm. From 1992 to 1998, Dr. Bauer was a visiting professor in Administrative Medicine at the Medical School of the University of Wisconsin-Madison, where he taught physician leaders how to evaluate research reports and other published studies. He received his PhD in economics from the University of Colorado-Boulder. He graduated from Colorado College in Colorado Springs with a B.A. in economics and completed a certificate in political studies at the University of Paris (France). During his academic career, he was a Boettcher Scholar, a Ford Foundation Independent Scholar, a Fulbright Scholar (Switzerland), and a Kellogg Foundation National Fellow. Dr. Bauer lives in Chicago, where he plays bass in a 17-piece jazz band and occasionally displays his paintings in art galleries. He is a member of the Governing Board of the Chicago Symphony Association.